I'm writing this review virtually a month after MASSEDUCTION initially dropped and, being honest, I still have no firm ground for which to judge it. 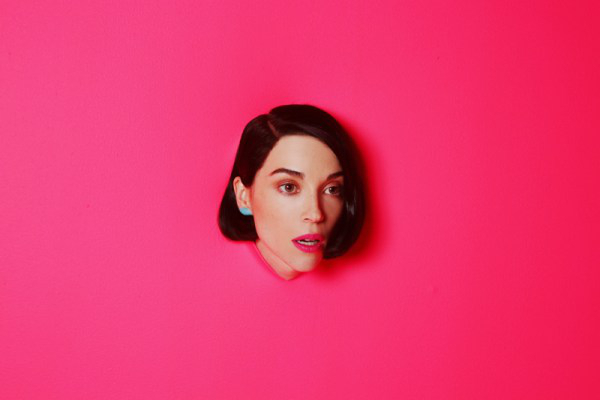 St. Vincent's fourth LP, at times, is aggravatingly enjoyable, frustratingly disappointing. Annie Clark's ridiculous transformation from everyone's favorite pure Indie soul to an aging expressionist who isn't afraid to expose her rear end to millions has me baffled. In 2014, the writing was on the wall. Her self-titled release exploded into the Art Pop world, stripping any wholesome fabric left from her humbling Indie roots. For the most part, I enjoyed St. Vincent a great deal, more so than any of her previous works. 'I Prefer Your Love,' for instance, was a remarkable mid-album peak that still acts as one of the most captivating love songs in recent years. Therefore, it's safe to assume that MASSEDUCTION should've continued the trend. And yet, with an irritating promotional campaign that screamed try-hand, from the artsy-fartsy photoshoots to the offbeat pseudo-press conference, and songs that topples over into music's out-of-touch no man's land, MASSEDUCTION struggles to remain interesting and/or relevant. Those are the peaks of the record. Unfortunately, MASSEDUCTION has plenty of shameful valleys. Many of these suffer in the same way 'Smoking Section's' power is diminished; the catchiness feels cheap. Here, similarities can be drawn to Arcade Fire's Everything Now or select tracks off Gorillaz's Humanz. As mentioned before, 'Pills' is the absurd outlier. So much so that the single rounds back to enjoyable territory, primarily because I can't believe Clark would even devise something so callow. Even though the second half is unnecessarily sentimental, 'Pills' knows just how preposterous it is. The tracks surrounding it? Not so much. Four of the next five tracks, excluding the extraneous melancholy of 'Happy Birthday Johnny,' are embarrassingly unfashionable. They seem so cheap and feeble, as if they're made of plastic. 'Masseduction,' 'Sugarboy,' and 'Savior' are the type of songs crafted by aging Pop stars desperate to glob onto the spotlight, wholly intrusive and ugly without saying anything prominent at all. They're tactless and tasteless. And, considering one is the title track, thoroughly representative of the album's overarching theme. A few bright spots can't dissuade the poor directional choices St. Vincent has made in an attempt at maintaining relevance. Comparisons can be pointed towards Everything Now, if only for the fact that it's two Indie stalwarts formerly in-tune with their own aesthetic deciding that, since the times are changing and youths are too, that they must as well. At the very least, Everything Now had a purpose. Sure, the worst moments made that message entirely unclear ('Chemistry' anyone? ), but there was a message. MASSEDUCTION truly has none, shifting between cultural commentaries ('Pills,' 'Los Ageless'), heartfelt ballads ('Happy Birthday Johnny,' 'Slow Disco'), and foul sexualization ('Sugarboy,' 'Savior'). What is Annie Clark trying to say with MASSEDUCTION? An album filled with any one of those aforementioned duos would've made sense. But a splatting of all amounts to nothing. Therefore, songs need to be appreciated within their own parameters. Unfortunately, as noted previously, that rarely works in St. Vincent's favor.